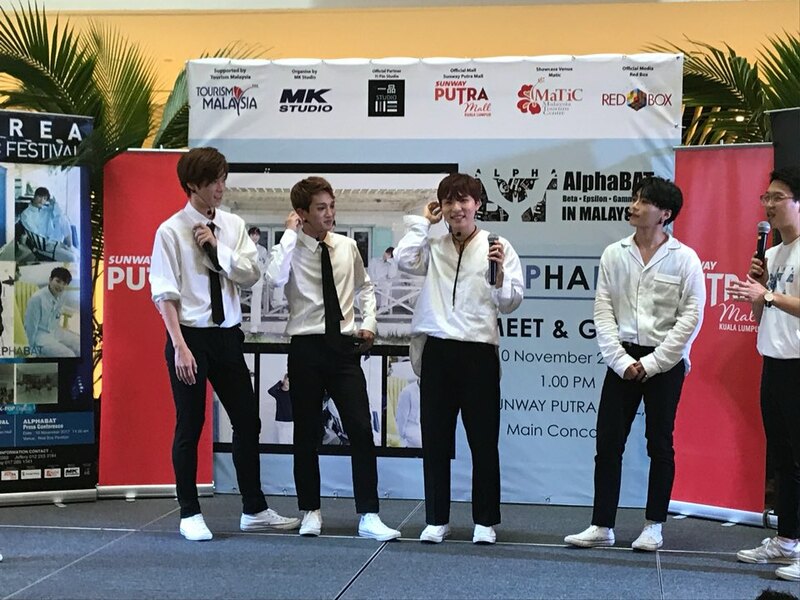 After the Press Conference with media in the morning, AlphaBAT kicks off their schedule with a Meet and Greet session at Sunway Putra Mall. 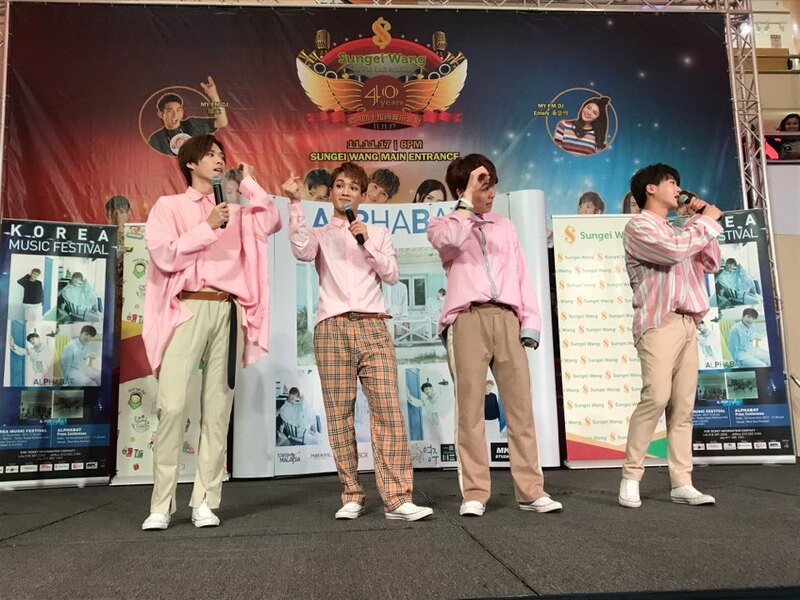 The session starts with their first performance of their debut song AB City, and then the members; Beta, Epsilon, Gamma and Kappa greeted the fans before having a short talk with the emcee. Kappa expressed his nervousness as it is his first time coming here as the new member of Alphabat but he was grateful to see the fans here welcoming them. Epsilon happily responded that he feels great to be here again after three years. Talking about their latest single, Get Your Luv, Beta explained that this time, the album showcases a fresher and tropical kind of feel. For fans information, there are two songs in this album; Get Your Luv and Baby. After the short talk, AlphaBAT were joined by their lucky fans on stage for a game session. 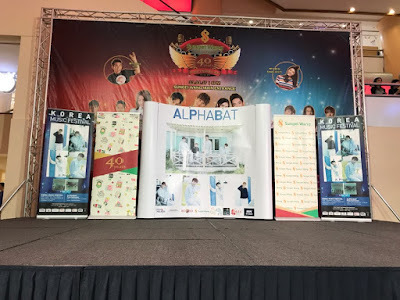 AlphaBAT members are paired up with fans for a Flipping Bottle game. It was a noisy and nerve-wrecking moment as Kappa and Beta beat the other members and battled each other in the final, of which Beta won. 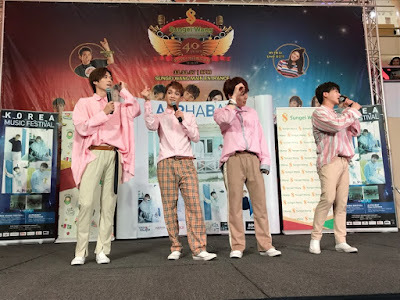 Back on stage, they performed Oh My Gosh, of which the MV was made in Malaysia, specifically at the Lost World of Tambun. 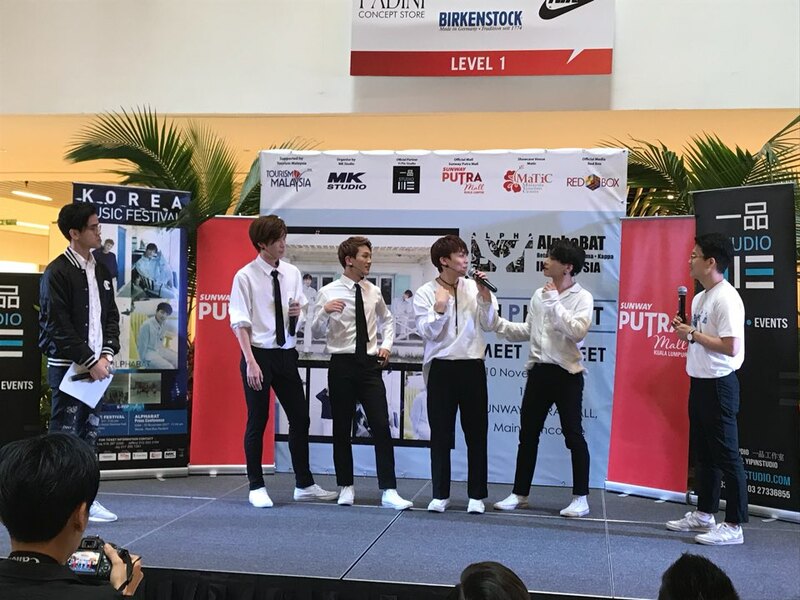 Afterwards, Epsilon said that they used to have nine members, but now we are four, with the new member Kappa joining in, and then they performed their last song for the meet and greet, which is Get Your Luv, before ending the Meet and Greet with a signing session. 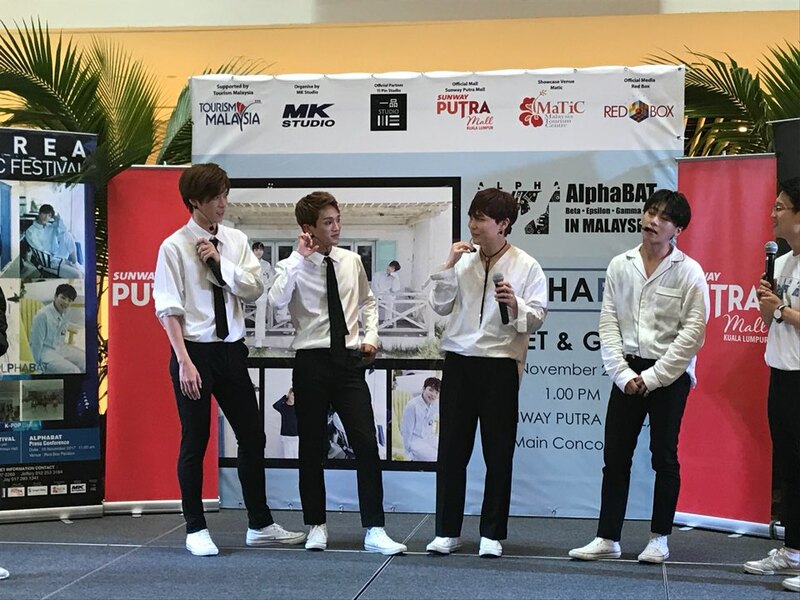 It was a short but impressive first appearance of AlphaBAT, which surely will make more fans to come for the next meet and greet session which will be happening tomorrow at Sungei Wang Plaza, in conjunction with Sungei Wang's 40th Anniversary. In conjunction with Sungei Wang's 40th Anniversary, AlphaBAT was invited as guest judge to their K-Pop dance competition, as well as having a Meet and Greet session at 4PM. Wearing sweet pink and beige outfit, AlphaBAT kicked off the stage with AB City. 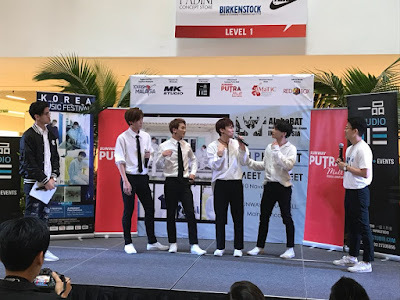 The leader, Beta told the audience that today is a special day for AlphaBAT because it is their 4th Debut Anniversary, before they proceed with their second performance with Oh My Gosh. Later on, they performed their comeback title, Get Your Luv, which is an upbeat tropical tune that showcases their cheerful and refreshing charms. Despite having only 4 members now, AlphaBAT showed a perfect dance routine, of which people might not realised that the first two songs are originally performed by nine members. 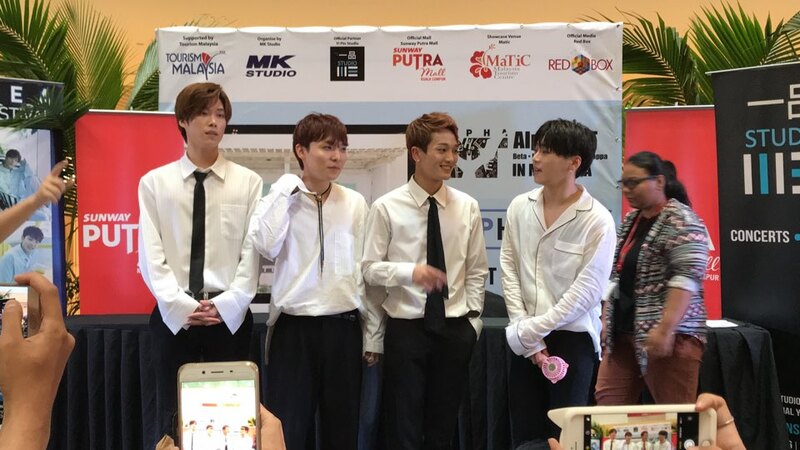 It was a super short Meet and Greet, as they convince fans to get the tickets to Korean Music Festival with AlphaBAT which will be held on Sunday at MATIC, Kuala Lumpur. Thanks to YiPin Studio for inviting us to cover the Press Conference and the Meet and Greet! Stay Tuned for HD photos coming up this weekend!